Community of Absence: Haegue Yang presents three new texts that speculate on an alternative notion of community vis-à-vis the development of contemporary artistic practice and in relation to the work of artist Haegue Yang. The book also includes excerpts of the scripts from Yang’s video trilogy (2004–2006) and a new composition of images and installation views of her recent works. With contributions by Binna Choi, Lars Bang Larsen, and Nina Möntmann. 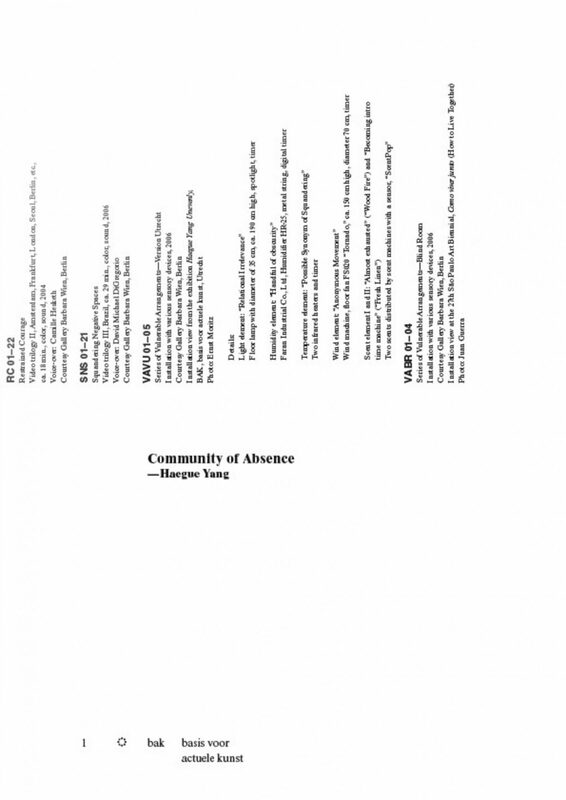 Community of Absence: Haegue Yang is published in conjunction with the exhibition Haegue Yang: Unevenly at BAK, basis voor actuele kunst in Utrecht, the Netherlands (23 April–18 June 2006).